If you're in the midst of a bathroom design project, you probably think you know a thing or two about classy toilets. But for some people, opulence doesn't have a price tag, and that's why Inax Corp. has revolutionized the bathroom throne with a gold-plated model called the Regio that features a digital sound system for a soundtrack to enjoy while one is on the bowl, according to The Post Chronicle. Japanese toilets have been at the cutting-edge of the sanitation industry, but this bowl is truly one-of-a-kind. The entire outside of the device is gold-plated, which certainly raises the item's price tag, but for some high-profile buyers, this is the perfect way to give their washroom a finishing touch. 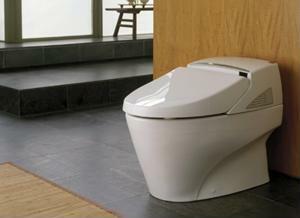 The toilet also features a built-in digital sound system that plays classical music such as Beethoven's Fifth Symphony. It also showcases a number of sanitary features available on many Japanese toilets including an auto-flush and an automatic cleaning system to remove bacteria. While the Regio is probably out of the price range of most Americans, it begs the question, what sort of decorative scheme would work with a gold-plated toilet?